At the beginning of the semester, I had posted a detailed description of my three part plan for assuring my success this semester. At that time, I was asked to report how the semester had gone based on my plan to determine its effectiveness. So here I will be summarizing the successes of this semester as well as the difficulties that I have encountered. I think it is important to note that I call them difficulties because I feel that as long as one learns from his or her mistakes, they are not failures, only difficulties. 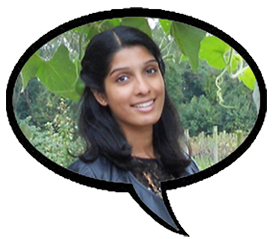 I will then try to analyze what aspects of the plan were helpful and which parts do may have contributed to my difficulties. This semester I took three classes. A five credit nursing class, a four credit nursing class, and a speech class. At the beginning of the semester, I organized my schedule, accounting for one day of reading for all my classes as well as scheduling set amount of times for additional preparation, assignments, and studying. I also began the semester with a plan of sleeping at least 7 hours a night, allowing myself some time for leisure activity and emergencies which might arise. There were a few things that I hadn’t counted in. In the past semesters, one day a week was enough to cover all of the material to be read for the week’s classes. Unfortunately, this semester the list of readings was a lot longer. Another thing that I had not worked into my schedule was the fact that each semester the classes require more intense studying, more assignments, and more reviewing. The last aspect that I didn’t factor in was SPRING FEVER/SENIORITIS. I didn’t think about the fact that I might suffer burnout of some sort. I thought I wouldn’t need more than a few hours a week of leisure. And I didn’t realize the importance of taking care of myself. So, you want to know how the semester went? Obviously it’s too early for me to know my grades, but I’m pretty confident that I am going to pass all my classes this semester with a decent grade. This semester wa a hard one for me. I’ve learned what it means to fail a test, but I’ve survived that experience. I’ve learned what it feels like when you’ve bitten off more than you can chew, but I’m learning to say “NO”. And I’ve learned that sometimes it’s ok to push off cleaning your apartment until after finals as long as you’ll get to it then. So that was my semester! How was yours? Fire Drills appear to be so last year. With the recent school shooting at Sandy Hook Elementary School, which left twenty students and six staff members dead, some schools have taken it upon themselves, to prepare for the likelihood of such an incident. During these mock attacks, masked men armed with guns, which are filled with blanks, break into a school, and take aim at the teachers and students. These attacks are meant to help people learn what to do, if they were ever in such a situation. But so far, the survival rate has been grim in many of these “attacks”. By one teacher’s account, in a library filled with fifteen teachers, only two went “unhurt” by the gunmen. She herself was hit multiple times. The city, for example, has been experimenting with surprise drills. But so far, the results have been mixed at best. During an unannounced practice lock down, at East Harlem’s Public School 79, which is home to special needs kids, the attack was so realistic, that a teacher called the cops. I for one, go back and forth on whether or not this is a good idea. While practicing for these attacks is good preparation, I think unannounced drills, is a step too far, and much too dangerous. You can’t control people’s reactions during these unannounced drills, which can lead to panic, and subsequently dangerous outcomes. 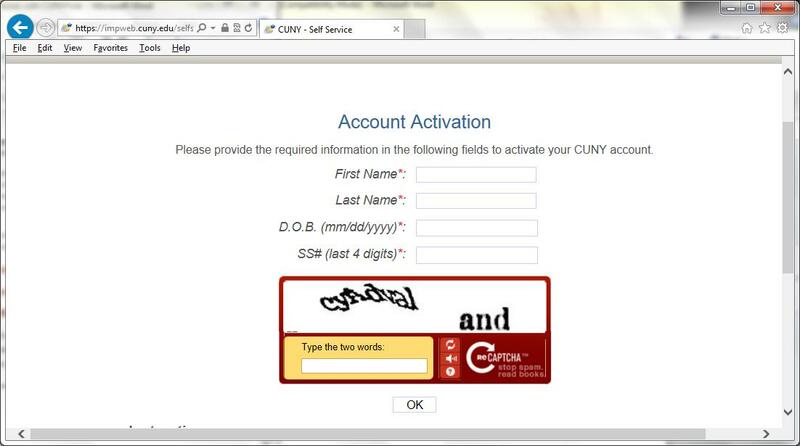 With finals week fast approaching, most of us don’t have time to attend a workshop to figure out the inner workings of the e-sims successor known as CUNYFirst. Since we really don’t have a choice in the matter, here’s a quick tutorial on registering for classes. 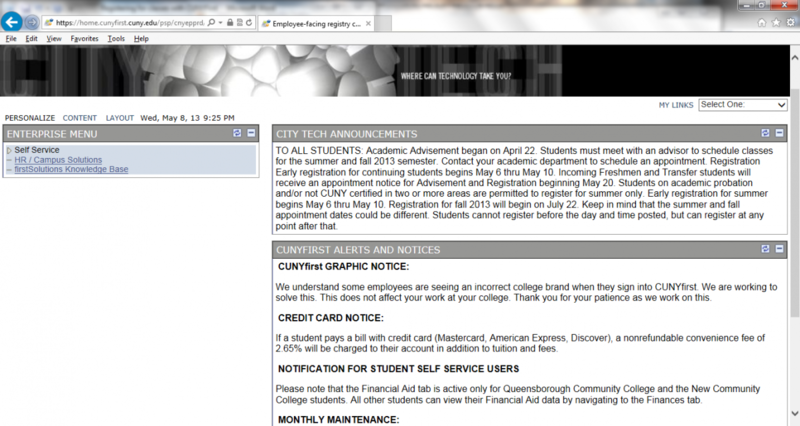 First and foremost, you have to have a CUNYFirst account. 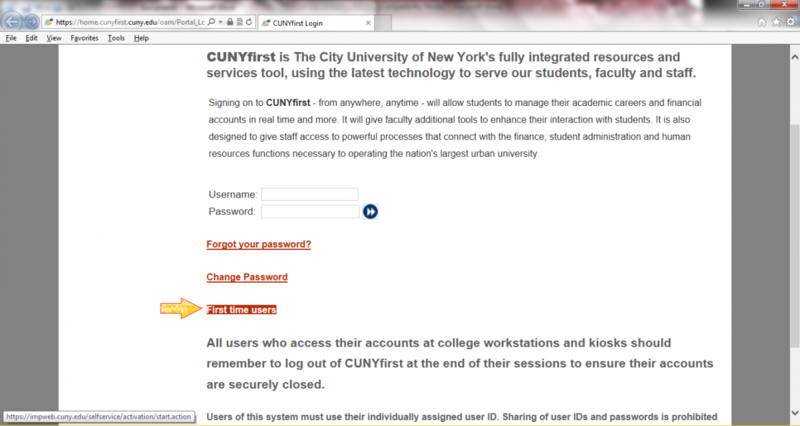 If you don’t already have one, go to https://home.cunyfirst.cuny.edu/oam/Portal_Login1.html and click First Time Users. From there, fill in the required fields – First name, Last name last 4 of social, etc. From there, follow the instructions on your screen to activate your account. Enter your username and password and hit the sign in button. 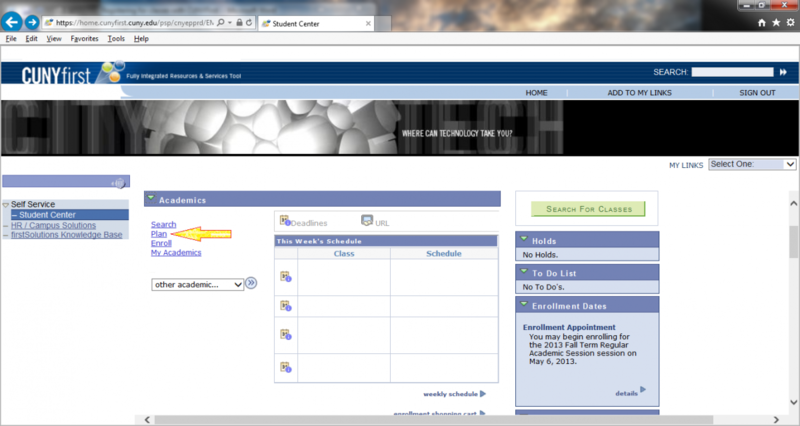 Click on the arrow that says ‘Self Service’ to extend the menu and click on ‘Student Center’. The student center is sectioned off into 3 sections main: Academics (which will list the classes you’re enrolled in), Finances (which lists and gives links to financial aid, awards, your account status and loan processing forms), and your personal information (which lists your home address, mailing address, phone number and campus email). On the right side of the page hold information about your academic account like your enrollment appointment, you academic advisor and links to order your transcript, view your degree audit, your FAFSA and your tuition payment plan. To begin registration, go to the Academics tab and click the green arrow to show the entire section. NOTE: You can skip planning and go straight to enrollment, but I don’t recommend it. 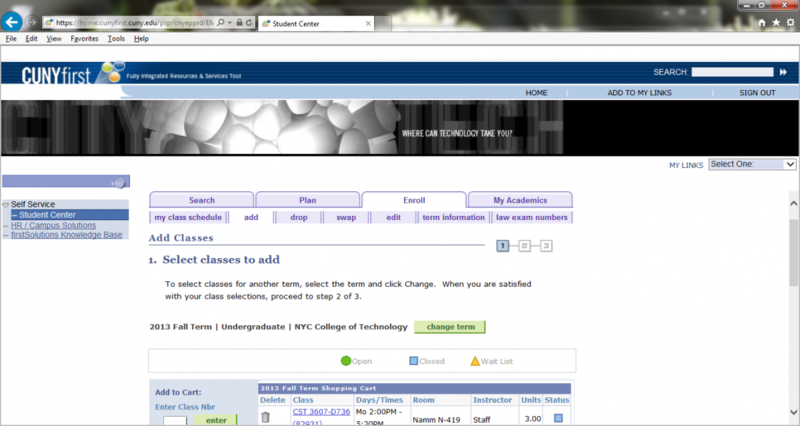 Unlike e-sims, CUNYFirst adds classes to a shopping cart before you can enroll so you will at some point, still have to go through the planning process. Once you click plan, the My Planner page will come up. 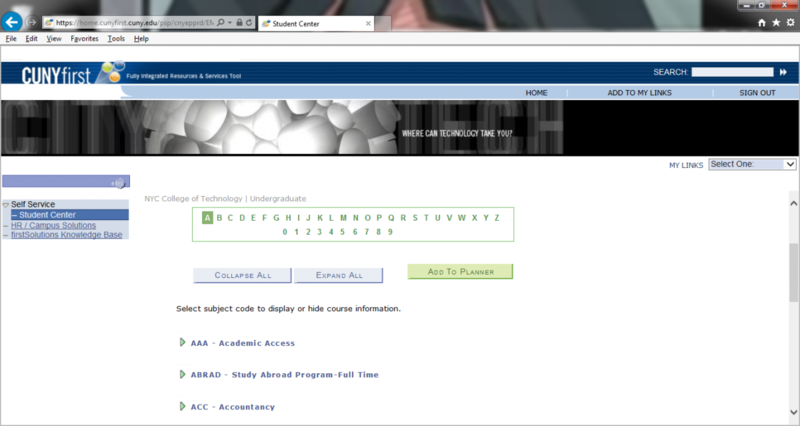 Once you’ve selected the courses you plan to take, they will appear on this page. Adding courses to your planner is like making a favorites list. It gives you quick access to information on the courses you need. 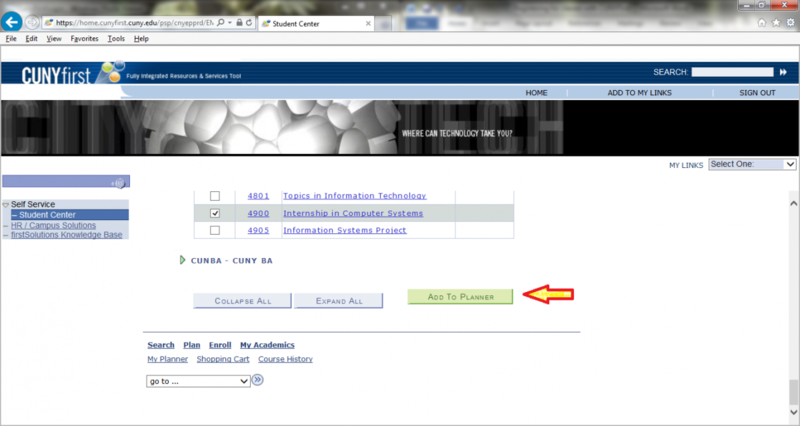 To add courses to your planner, begin by clicking “Browse Course Catalog”. Courses on this page are sorted alphabetically by department Consult your degree audit via CUNY Portal to figure out which courses you need to take. 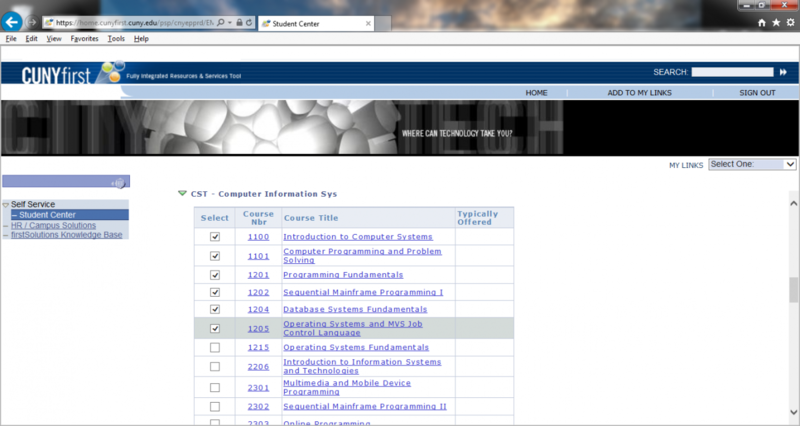 Click the arrow next to the department to show all the classes available. Then select the classes you want to add to your course planner. You can either add the courses you need for the rest of your degree, or just the ones for the upcoming semester. When you’re done selecting, scroll down to the bottom of the page and click “Add to Planner”. 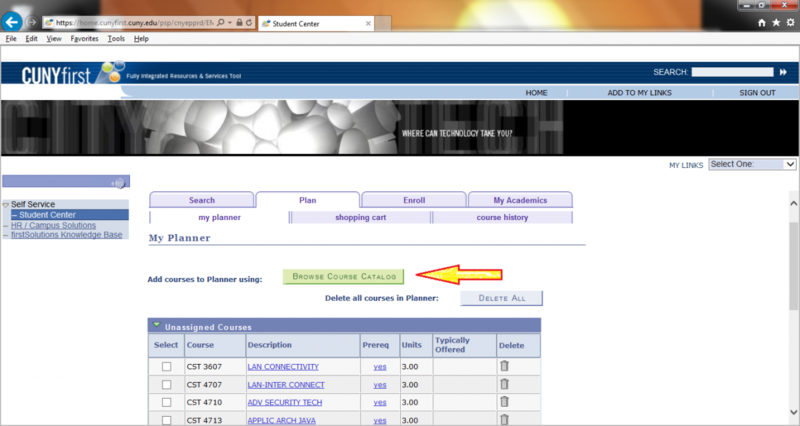 Once you’ve added everything to your course planner, go back to the Self Service page and click enroll. You will then be asked to select a term. If you’re signing up for summer classes, select summer term and if you’re registering for fall classes, select fall term then click continue. From here click the green view class sections. 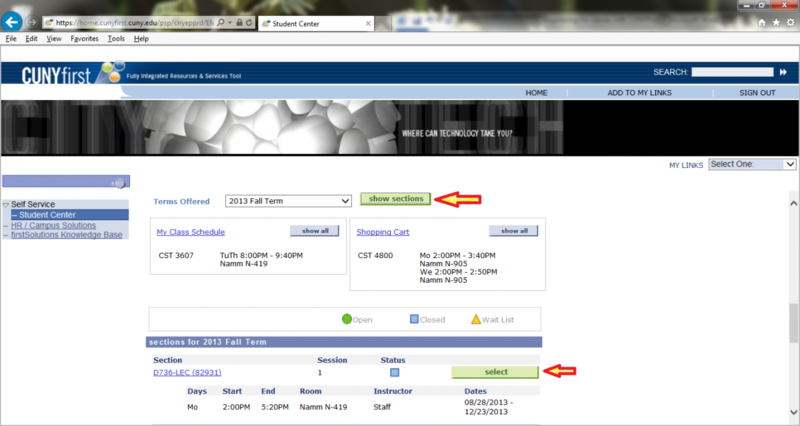 Make sure you have the right semester selected before you click the green show sections button. When you find a section that you want to take, click ‘select’ and then ‘next’ and you’ll see a message that says the class has been added to your cart. 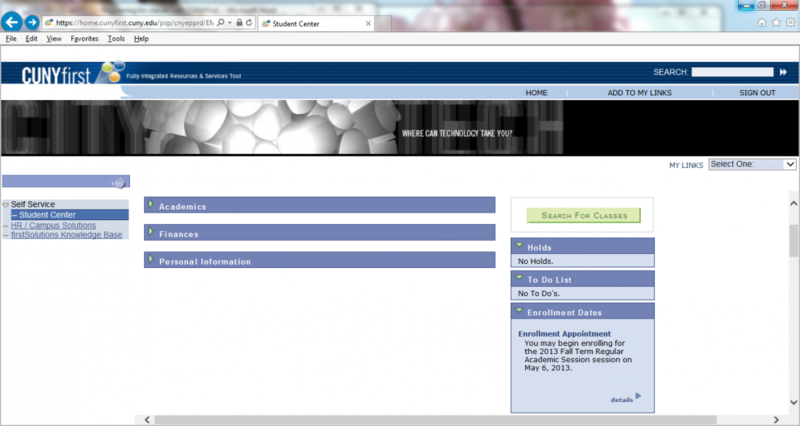 From the above page, or from the Student Center page, now click enroll. Select your term and click continue. 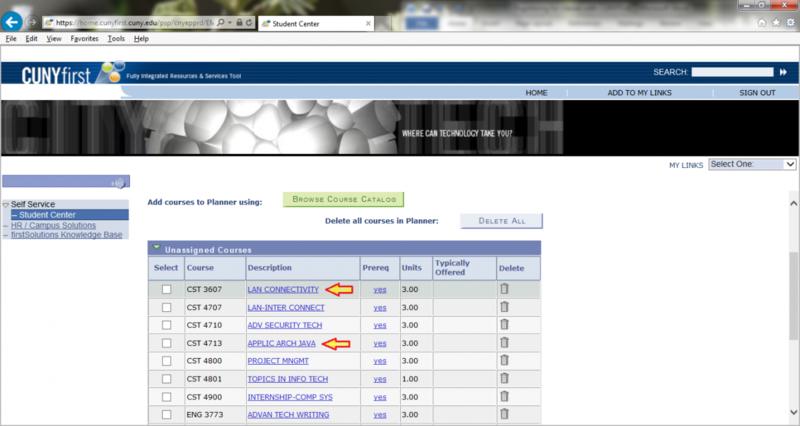 Click on the ‘add’ tab underneath enroll and double check the courses and times listed. 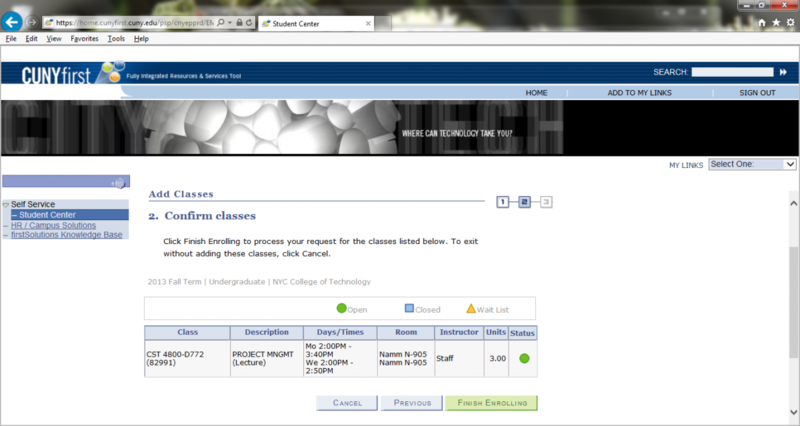 Once you’re satisfied with your schedule, scroll down and click “Procced to Step 2 of 3”. Confirm that these are the classes and sections that you want and click ‘Finish Enrolling’ and you’re done!